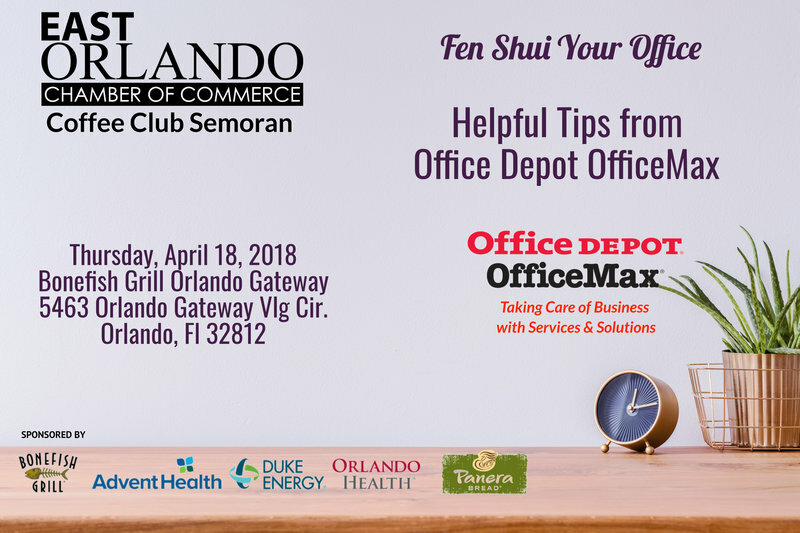 We are putting the Fen Shui in your office Space. Join our Office Depot team to create the perfect space for your creative & productive self. Coffee Club Semoran meets the 3rd Thursday of the month at Bonefish Grill Orlando Gateway. The format of the group includes a fun networking activity or guest speaker with some open networking. Advent Health, Duke Energy, Orlando Health, Panera Bread our coffee sponsor and our host sponsor Bonefish Grill. 5463 Orlando Gateway Vlg. Cir. Copyright © 2014 East Orlando Chamber of Commerce. All Rights Reserved.